Tight jumps, slow velocity, complicated puzzles and weird creatures that wants to kill you for no reason. The world of Yalmrith is unique and deadly you take control of Andor a doll with a form of life and it have to face many platforming mechanics, logic puzzles to solve and battle strange creatures for the sole purpose of gaining knowledge about this strange world and you within it. You may think our hero doesn't have the agility nor the speed to face the platforming obstacles , but you will be surprised on how YOU & Our Little Hero will succeed in doing so. 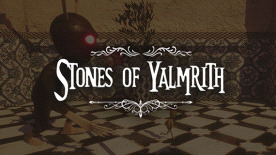 In the world of Yalmrith each puzzle is unique in the way it was crafted, scripted and how you will solve it, take your time, because each puzzle in The Stones of Yalmrith will take a lot of yours. No need for spoilers, you will have to face them yourself in the world of Yalmrith, don't be afraid and don't worry, we are sure you can handle them perfectly. Enjoy the full Yalmrith Experience by carving your own path . The Stones of Yalmrith is playable using a keyboard and a mouse but for an amazing experience we recommend using a Gamepad. The Stones of Yalmrith includes the Unreal® Engine code and other code, materials, and information (the “Epic Materials”) from Epic Games, Inc. (“Epic”). All Epic Materials are provided on an “as is” and “as available” basis, “with all faults” and without warranty of any kind. [Licensor], Epic, and Epic’s affiliates disclaim all warranties, conditions, common law duties, and representations (express, implied, oral, and written) with respect to the Epic Materials, including without limitation all express, implied, and statutory warranties and conditions of any kind, such as title, non-interference with your enjoyment, authority, noninfringement, merchantability, fitness or suitability for any purpose (whether or not Epic knows or has reason to know of any such purpose), system integration, accuracy or completeness, results, reasonable care, workmanlike effort, lack of negligence, and lack of viruses, whether alleged to arise under law, by reason of custom or usage in the trade, or by course of dealing. Without limiting the generality of the foregoing, [Licensor], Epic, and Epic’s affiliates make no warranty that (1) any of the Epic Materials will operate properly, including as integrated in the [Product], (2) that the Epic Materials will meet your requirements, (3) that the operation of the Epic Materials will be uninterrupted, bug free, or error free in any or all circumstances, (4) that any defects in the Epic Materials can or will be corrected, (5) that the Epic Materials are or will be in compliance with a platform manufacturer’s rules or requirements, or (6) that a platform manufacturer has approved or will approve this [Product], or will not revoke approval of this [Product] for any or no reason. Any warranty against infringement that may be provided in Section 2-312 of the Uniform Commercial Code or in any other comparable statute is expressly disclaimed by [Licensor] and Epic. [Licensor], Epic, and Epic’s affiliates do not guarantee continuous, error-free, virus-free, or secure operation of or access to the Epic Materials. This paragraph will apply to the maximum extent permitted by applicable law. To the maximum extent permitted by applicable law, neither [Licensor], Epic, Epic’s licensors, nor its or their affiliates, nor any of [Licensor’s] or Epic’s service providers, shall be liable in any way for loss or damage of any kind resulting from the use or inability to use the Epic Materials or otherwise in connection with this [Agreement], including but not limited to loss of goodwill, work stoppage, computer failure, or malfunction, or any and all other commercial damages or losses. In no event will [Licensor], Epic, Epic’s licensors, nor its or their affiliates, nor any of [Licensor’s] or Epic’s service providers be liable for any loss of profits or any indirect, incidental, consequential, special, punitive, or exemplary damages, or any other damages arising out of or in connection with this [Agreement] or the Epic Materials, or the delay or inability to use or lack of functionality of the Epic Materials, even in the event of [Licensor’s], Epic’s, or Epic’s affiliates’ fault, tort (including negligence), strict liability, indemnity, product liability, breach of contract, breach of warranty, or otherwise and even if [Licensor], Epic or Epic’s affiliates have been advised of the possibility of such damages. These limitations and exclusions regarding damages apply even if any remedy fails to provide adequate compensation. Because some states or jurisdictions do not allow the exclusion or the limitation of liability for consequential or incidental damages, in such states or jurisdictions, the liability of [Licensor], Epic, Epic’s licensors, its and their affiliates, and any of [Licensor’s] or Epic’s service providers shall be limited to the full extent permitted by law.